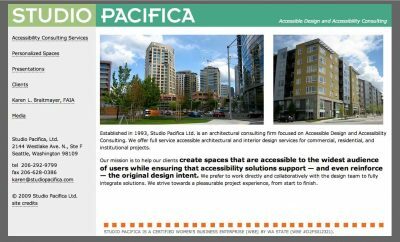 Karen L. Braitmayer, FAIA, needed a website to promote her accessible design consulting. The site needed to be accessible by assistive devices, so WAI/508 guidelines had to be considered. The new site is 100% CSS, and displays in assistive devices. Unlike table-based web designs, CSS web sites are adaptive to a wider range of web browsers. I love working with you, and trust you so much.